Farid Abou Cha’r arrives in Beirut on a hot summer morning with his manuscript, looking for a publisher. He is turned down by all of them – “nobody reads anymore” he is told. And instead of finding a publisher, he is offered a job as a proof reader at the famous old print house “Karam Bros.”, allegedly established in 1908. Disappointed at first, Farid accepts the offer, secretly hoping that his book will eventually be published. A serious and committed worker, Farid nonetheless deeply despises the texts he is asked to proofread: catalogues for international brands, fashion magazines, medicine prospectuses… His manuscript, handwritten in a red notebook, never leaves him. Until one evening, it disappears from his desk. A couple of days later, his book reappears, manually printed in the old way, using the most sophisticated – though unreadable – font. Farid is of course pleasantly surprised. Little does he know that the person behind this ‘gift’ is no other but his boss’ wife, Persephone, a very attractive young woman of Greek descent, who, out of boredom and frustration, plays a little seduction game with the athletic looking, and quite naive, young man. He is even less aware of the fact that his book was printed on the most expensive paper, precisely the paper Karam Bros. uses to print fake twenty euros bills. Consequently, Farid finds himself entangled in an international police investigation, in which Karam Bros. is a prime suspect – and connectedly, in the middle of a intrigue involving some dirty insurance money. Through Farid, and the manuscript that no one ever reads, Douaihy tells the most interesting story of the Karam print house. Once a prestigious establishment where the printing of Lebanese constitution was entrusted, now, at least in appearance, it lives off gossip magazines and sportswear brochures. In truth, Karam bros. lives off the fake euro bills it prints. To take matters further: Karam bros. could not have been established in 1908 since the grand-father had initially stolen the printer from a Jesuit monastery at the end of World War I. And that grand-father’s name was Karrum, not Karam. In this kind of play on appearances, Douaihy dizzies the reader who is repeatedly sent back to a different truth, until he realizes it is all fiction. There might have been a time where poets, intellectuals, politicians, believed in the real value of ideas and in the exceptional and bright future of the region. This time, if it truly existed, is long gone. Still, it is to this era that Farid Abou Cha’r (born in 1980) sees himself as belonging: a man of innate talent — another myth Douaihy gently mocks — waiting to be revealed. 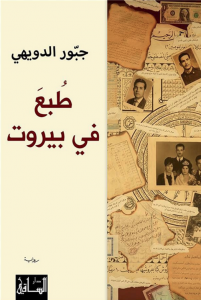 Featuring 36 chapters each of approximately 1000 words, Printed in Beirut has a strict rhythm, which structures a wealthy content, spanning from the beginning of the 20th century till the present. Though exploring a somewhat different style with this novel, Douaihy, as always, portrays society with biting irony. Cet été-là, alors qu’une chaleur torride s’était abattue sur Beyrouth, on vit un jeune homme aux sourcils crochus, relevés comme s’il disait toujours non, descendre d’un autobus en tenant près du cœur, tel un bras en écharpe, un épais cahier à la reliure rouge, et se lancer d’un pas vif sur le trottoir, qu’il martelait de ses talons neufs en évitant les arbres plantés là comme des obstacles et les passants qui déambulaient sans se presser. S’engouffrant dans un immeuble à la façade rehaussée d’une sculpture de basalte sombre, dont un obus d’artillerie avait un jour accentué le côté abstrait, il arrangea sa cravate rouge criard devant le miroir de l’ascenseur, puis plongea son nez sous son aisselle droite pour renifler sa sueur, avant de se présenter à un homme à l’âge indéfinissable, dans son bureau orné d’une affiche allemande de l’Opéra de quat’sous. Ce que j’en dis n’est pas de pures conjectures ! Farid Abou Chaar lui serra la main et repartit. Grimpant à l’arrière d’un taxi, il se mit à grommeler d’une voix audible la riposte cinglante qu’il aurait aimé jeter à la face de ce gros rustre qui, comme si de rien n’était, avait repris la saisie de son ode préislamique sur son ordinateur. Le chauffeur se retourna vers lui plusieurs fois en le conduisant chez sa mère.